Reph is an emcee, producer, writer and mixed media visual artist creating wherever, whenever, and in whatever medium he chooses. From music production to painting, nothing is out of bounds and anything can happen when he is involved. His skills in the visual arts and music were developed through writing and cyphering on the block daily. That coupled with a passion for technology, history and social change is what led him to what he is doing today. He visions this work as a reflection of the human experience through the eyes of the Hip-Hop generations. His visual art combines the simplicity of the line with expressive use of color to create order within chaos. The work strives to embody life's contradictions and humanity's relationship to those contradictions. It is also visually influenced by the indigenous Taino pictographs found throughout the Caribbean, traditional Japanese crest designs, New York City Graffiti art, revolutionary print making of the 1960's & 1970's, and the classic American children's book Harold and the Purple Crayon. When painting Reph doesn’t usually like to plan many things in advance, he just lets it happen. His artistic process is as much about the act of painting as it is about the act of living while waiting for the right moment to arrive, with some works being created in a few hours and others over a series of months or years. Reph was recently featured on HBO Latino in “RoadTrip: NYC” and “Habla Ya”. He is the producer behind the 2007 Cuervoton contest winner PattyDukes and his music has been featured in the underground online cartoon sensation, Three Thug Mice. Reph played the role of “Chico” in Caridad De La Luz “La Bruja’s” BoogieRican Blvd: The Musical at the Puerto Rican Traveling Theater to rave reviews in the New York Times. He is the winner of the 2006 UAI (Urban Artist Initiative) grant from AHA! 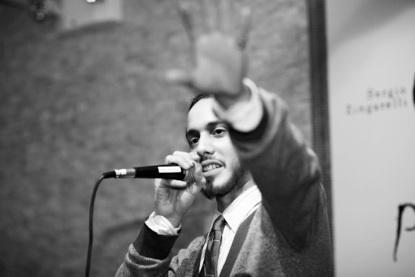 (Association of Hispanic Arts) and NYFA (New York Foundation for the Arts) for founding the Rhyme Factory, rhymefactory.com, a non-profit organization that supports youth pursuing careers in Hip-Hop. Reph is also a member of Hip-Hop group Circa ’95. Their debut album “Free Lunch” was released in November of 2011 and is available via circa95.com. These days he can be found in the studio working with Circa ’95 and the rhyme factory.